After thirty years of faithfully serving the public as a buyer and seller of precious metals and numismatic (collector) coins, Swiss America Trading Corp. is very concerned by the influx of gold dealers making false claims, deceptive promises and non-deliveries of goods to customers. 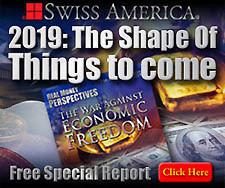 "When it comes to buying or selling precious metals, 'caveat emptor' (let the buyer beware) is the best rule of thumb in today's marketplace fraught with fraud, scams and hustlers," says Swiss America Chairman Craig R. Smith, who has been an active coin trader for nearly half a century. Mr. Smith is a pioneer in providing customer transparency, full disclosure and a buy-back policy since founding Swiss America in 1982 from his Phoenix, Arizona home. Since then, as the public has slowly rediscovered the wisdom of asset diversification; the firm has grown a hundredfold, built a corporate headquarters, operated debt-free and maintained a stellar industry reputation nationally. According to Mr. Smith, there are scores of ways unethical gold dealers are scamming the public today, including over-pricing coins, over-promising performance, over-selling the product and long or even non-delivery of the product after payment is made. Smith believes the rise of the Internet has been both a blessing and a curse for inexperienced coin shoppers. Searching for a reputable gold dealer can be very confusing as consumers wade through a mixture of hard-to-understand information, disinformation and half truths from an industry that, until recently, has had a general lack of accountability. To help protect consumers from gold fraud and scams, seven years ago Mr. Smith helped found NCA, the Numismatic Consumer Alliance (www.stopcoinfraud.org), a New Jersey-based not-for-profit organization that has helped consumers recover $5 Million since it began in 2005. According to the NCA Website, "Many of these buyers are senior citizens with no knowledge of coins who also lacked the Internet savvy to check out what they were buying and who they were buying it from." NCA co-founder John Albanese writes, "The industry has failed to prove its ability to competently self-regulate and police transactions between itself and the public. The company intends to bring attention to, and thereby illuminate certain types of fraudulent and illegal conduct." Sadly, Smith expects the trend of rising consumer fraud and scams to grow in the months and years ahead as predatory marketers continue their own “gold rush” into this field where investors are coming to seek security in an uncertain economy. This is why Smith coined the phrase "learn before you earn" as the first step for consumers to avoid being hustled and rushed into buying gold coins from the wrong firm. Two decades ago Mr. Smith first published six basic, practical steps to help consumers avoid gold fraud and scams. 1. Buy and sell U.S. gold coins from a recognized national dealer or broker who has experienced the ups and downs in the market and has at least a 10-year track record. Find out if a dealer is a member in good standing with the Better Business Bureau, American Numismatic Association (ANA), Industry Council for Tangible Assets (ICTA), Certified Acceptance Corp (CAC), Numismatic Guaranty Corp (NGC) and Professional Coin Grading Services (PCGS). 2. Make sure the gold dealer offers a two-way market. Confirm the dealer will not only sell the coins but also provide, in writing, their buy-back policy. Closely examine their buy-back policy. Make sure the buy-back price does not vary on a basis of quantity. Also inquire about the time factor for repayment. Reputable companies will always settle a trade within 72 hours. 3. Buy only PCGS or NGC certified "sight-seen" (vs. unseen) U.S. numismatic gold or silver coins with a fair inspection period after delivery. This ensures buyers the option of exchanging a coin if they don't like its appearance. Make sure your coin has been inspected for copper spots and other imperfections by at least two numismatists. 4. Look for full, truthful disclosure. Be sure the dealer has presented both the upside and downside risks associated with the coins being purchased. Short-term versus long-term positioning should be explained to in clear, understandable language. Beware of dealers who suggest putting more than 30% of one's assets into precious metals. 5. Be sure the gold or silver coins can be bought and delivered at the prices quoted. In other words, don't just buy the quote, buy the coin. Anyone can promise to sell coins 10%, 20%, or even 75% less than another dealer IF they don't have the coins to deliver. Make sure the dealer can actually deliver the coin quoted at the price quoted. 6. Buy from a gold dealer in whom you have complete trust. Check references carefully. Most importantly, ask many questions before buying or selling, and get satisfactory answers. Demand facts, historical performance charts and portfolio tracking tools, and ignore the hype. Always keep in mind that a profit is not made buying a gold coin, but only when the time comes to sell it. Anyone following these six steps will be well on his or her way to having a positive experience in buying and selling precious metals. 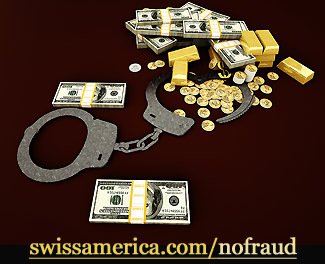 For more information visit SwissAmerica.com/nofraud, which has additional tips on avoiding gold scams from the Commodities and Futures Trading Commission as well as educational videos and other resources on the subject available free to the public. For media interviews with Craig R. Smith please contact: Bronwin K. Barilla at 1-800-950-2428 or bkbarilla@swissamerica.com.